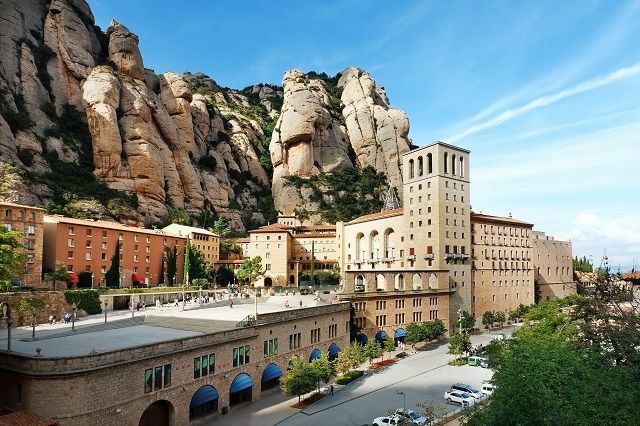 One of the most popular one day trips near Barcelona is Montserrat. This peculiar mountain range, that stands for jagged mountain in catalan, is home to the Virgin of Montserrat, the patron saint of Catalonia. It’s a very popular one day trip from Barcelona. The curvy-like stones are product of a geological process that ocurred millions of years ago when all this region was a delta. The erosion shaped the stone into an intricate array of caves, peaks and cracks, many resembling animals like the famous peak called “The elephant”. Legend say that in 880, shepherds saw a light coming down from heaven at this place. The local Bishop in Olesa, the nearby town, organized an expedition and the holy image of the Virgin was found in a cave. Apparently, the holy image was so heavy that the Bishop interpreted that the Virgin wanted to stay there, so he ordered the construction of a chapel. The monastery would be built years after, although its origins are uncertain. Montserrat combines very different activities. While it’s a pilgrimage destination for many believers, it’s also a very popular spot for climbers and hikers. The Montserrat Basilica is a must see attraction, as well as the Benedictine Monastery of Montserrat. Inside, it’s possible to get a quick look of “La Moreneta” (Tha Black Madonna) inside the Basilica. It’s believed that the wooden-carved statue turned to dark after the effect of the varnish after time. On the other hand, many hiking trails connect the top peaks from the monastery and the base of the mountain. A great deal of these walking routes lead to spectacular observation sites. There are two Funicular tramways. The Sant Joan Funicular, reaches the top of cliff overlooking the monastery and the Santa Cova Funicular, decends into a sanctuary. Take the metro to Espanya station using L1 or L3, then change for the FGC Railway to S4 Line. If you wish to get there by Funicular Tramway, stop at station Monistrol de Montserrat for transfer.